>Hail Seitan! All praise Seitan! This was my second attempt at making my own seitan. I tried the boiled method first and it was a disaster… to put it mildly. Soggy sponge disintegrating and dripping soy sauce all over the kitchen. Tried to strain it with cheese cloth to no avail. In truth I suspect the problem is that I’ve moved a bunch of ingredients 4 times now and that the container I thought was wheat gluten was probably a different flour entirely. As in, who knows? 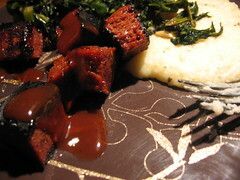 This time I bought new gluten and tried the baked Seitan o’ Greatness recipe from the PPK. I think I baked it at too high a temperature since it was pretty dry to start out with. First I ate it straight. Then I experimented on poor P. and soaked the remaining chunks in BBQ sauce before putting them on my Foreman. To my surprise the chunks soaked up ALL the sauce and then caramelized dramatically. I let them go too long and the sides got very black and hard. Flavor was good but it was rather like trying to eat fiberglass. They’re better after rehydrating and chilling in the fridge for a few days. The thing is that it doesn’t matter one that they weren’t perfect. As far as I’m concerned I finally got the chemistry to perform as it should and I’ll get better with practice. 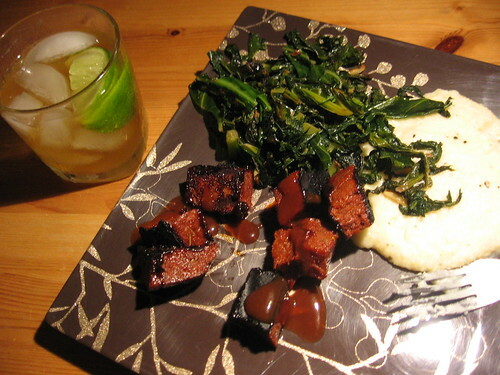 Seen here: BBQ Seitan w/ Asiago Grits and White-Grrl Southern-Style Garlicky Greens. Now I’m hardly the first vegetarian blogger to try this experiment. Satisfying regardless. Posted on August 21, 2009, in Uncategorized. Bookmark the permalink. 2 Comments. >It LOOKS delicious though! Was the texture of the non charred part any better? >I can state from personal experience that the non-burned Seitan was pretty good. And good as leftovers too.